More than one-third of the Earth’s land surface is arid and semiarid lands with meager rainfall. At present, more than one billion people inhabit these regions, not including potential areas of desertification that are threatened by drought. Sand dunes are among the most common features in these arid lands. Knowledge about how sand seas and dune fields were formed in the past and how they evolved in response to climate change is important for understanding the interactions between dryland environments and climate, and for predicting their future changes under global warming conditions. Geomorphologists and Quaternary scientists have found that the ecological and geomorphic systems in the sand seas and dune fields do not stay the same through time. Instead, these landscapes are sensitive to climate change. One significant change of arid lands in response to past climate change has been the transformation between activity and stability of extensively distributed sand dunes. For example, the central Great Plains in the United States was once dominated by extensive active mega-dunes as seen today in the Sahara Desert, while parts of the Sahara were covered by luxuriant vegetation and numerous lakes thousands of years ago. The formation and activation of sand seas and dune fields are often associated with dry and windy climates. In the geological past, the Earth’s climate has experienced cold and warm periods, so-called glacial-interglacial cycles. A strong linkage between dune activity and paleoclimatic change over glacial-interglacial cycles has been identified by scientists. Specifically, it is widely proposed that cold, dry and windy climatic conditions during glacial periods should have favored strong aeolian activity in many deserts and arid regions around the world, with less dune field activity or even full stabilization during interglacial periods under warmer, wetter climates. However, a mystery in the desert is that in many dune fields, there is only scarce evidence of aeolian sand deposition during the Last Glacial Maximum (LGM), a geological time period about twenty thousand years ago when sea level had dropped substantially and the climate was extremely dry in inland regions of large continents. Instead, using newly developed techniques which allow precise determination of the last time mineral grains exposed to light as they were carried by the wind (called optically stimulated luminescence dating), scientists have found that most wind-blown desert sands were mobile at much more recent times than the LGM. This finding suggested that the sand dunes mostly accumulated during the deglacial period when the climate became warmer and wetter than the LGM or was activated in very recent times due to both recent climate change and human intervention. Dr. Zhiwei Xu from Nanjing University, China and his colleagues, Prof. Dr. Joe Mason from University of Wisconsin Madison, Prof. Dr. Huayu Lu, Dr. Shuangwen Yi, Mr. Jiang Wu, Dr. Zhiyong Han from Nanjing University and Dr. Yali Zhou from Shaanxi Normal University, analyzed hundreds of barchans and transverse dunes in the Mu Us dune field that located in northern China, illustrated the migration and stabilization processes of the dunes, and used them as a case study to show how the morphodynamics of the dunes (the way their shapes changed over time) would influence the accumulation and preservation of aeolian sand. It is found that the dunes the Mu Us dune field are not large, and most of them have the high migratory capacity so that they can be turned over or stabilized in relatively short time periods (less than one hundred years in most cases). Based on a simplified sand preservation model and the stratigraphy (internal layering) of the dunes, they suggested that during times of intensive aeolian activity, for example, dry and windy periods, the dune sand would frequently be remobilized by the wind and exposed to light each time. Only rare deposits of sand left behind by migrating dunes would left as evidence of widespread, long-lasting dune activity. 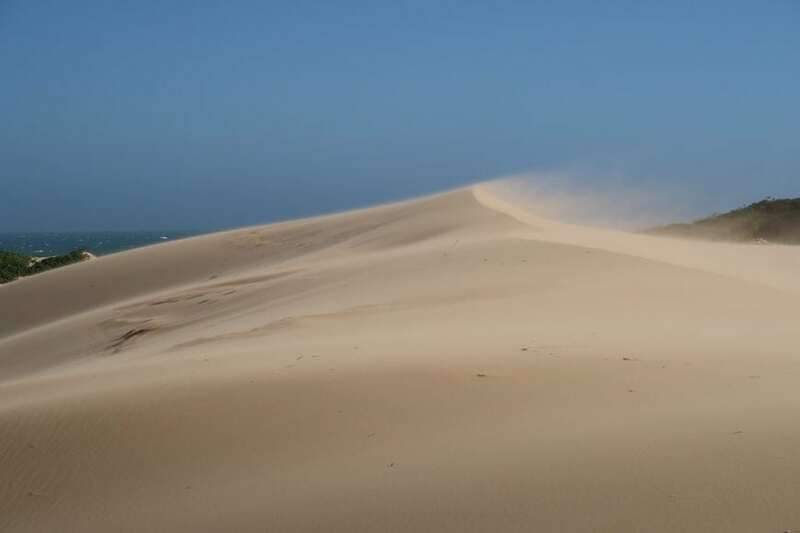 In contrast, thick sands would be accumulated and preserved near the very end of a dune activity episode, as entire dunes were stabilized by vegetation, often recording a climatic change toward wetter conditions. Dating these thick sands will reveal the end of a period of dune activity as the climate changed, but not its earlier phases. This conclusion implies that the large dunes in many dune fields around the world might actually represent only the final phase of sand accumulation at the end of the dry and cold glacial period, often remobilized and modified by more recent periods of activity. Sand dunes have been widely used as sedimentary archives to reconstruct the paleoenvironment and paleoclimate. However, this recent study by Xu et al. (2017) shows the complexity of dune deposits as paleoenvironmental records. The relatively short turn-over or stabilization time of the small dunes indicates that the dunes can change quickly in response to short-term climatic or anthropogenic disturbances, however, it is important to understand how those morphological processes could have influenced the preservation of dune sediments. This study, Crescentic dune migration and stabilization: Implications for interpreting paleo-dune deposits as paleoenvironmental records, was recently published in the Journal of Geographical Sciences that is sponsored by the Geographical Society of China and published by both Springer and Science Press.